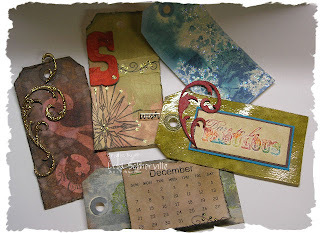 I'm slowly getting caught up with Tim's 12 Days of Christmas Tags - I've got 6 of the 8 done. I showed 1 the other day here, now Today, I've got 5 more to show! All Ranger Products can be purchased online at Innovative Stamp Creations . Awesome tags!! I haven't started Tim's tags yet, but I will be! Yours are so pretty - maybe you should show them off one at a time with a recipe so we can copy yours too! Just kidding (kind of). I'm sure Tim spends many hours writing up those instructions - we can get them at his blog and just ogle your goods! Wow! Awesome tags...just found your blog and added u to my blog list.